Today I have collected the best of the WordPress Magazine Themes and listing the best premium as well as free Magazine Themes for you. 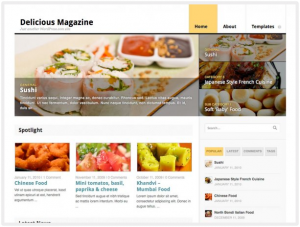 Delicious Magazine comes with an extensive set of theme options that make it easy to fit Delicious Magazine to your site’s unique personality. From Appearance → Theme Options you can set the color scheme of your site with one click and also take total control of the animated Featured Post slideshow. You can even choose to have your sidebar on the left or right side of your site. 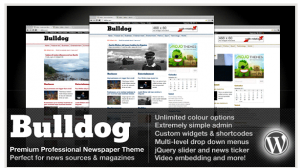 Bulldog is a Premium Professional WordPress Newspaper Theme. 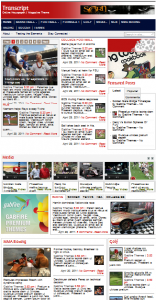 Bulldog is a Premium Professional WordPress Newspaper Theme. Bulldog uses native WordPress 3 functions where available, and a single page options panel makes adding, removing and customizing features a breeze. 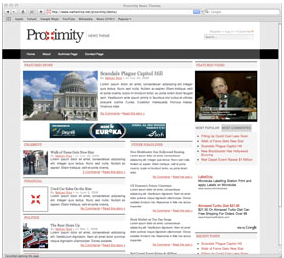 Proximity is a Premium most advanced WordPress News Theme. The home page is completely configured from theme option panel. Proximity theme developed for easy to use. Custom header image, Theme option ranging from excluding pages from your top navigation, to choosing an alternate feed URL, to adding your own adsense code, all from the Proximity News Theme Options panel. The News Theme is Premium theme and created to hold large amounts of content while still providing a great user experience and interactive design. The theme is designed without the use of any background images, resulting in faster loading times and easy customization. With the addition of several color change options. The theme offer many unique features including Ajax loaded content, a featured tab section, news ticker, social media buttons, several widgetized areas and much more. 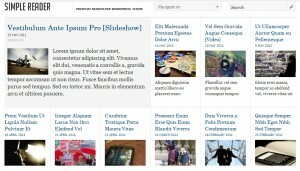 BlogNews is Premium theme. BlogNews is a multi-purpose and stylish magazine theme with a unique homepage that is aimed to those who want a more professional feel to their site. With 7 alternate styles and advanced theme control panel options the theme gives ability to run a Newspaper or Magazine style website. SimpleReader is the Premium and responsive layout theme. It’s powered by our all-new theme options panel and integrated with a comprehensive SEO management system. 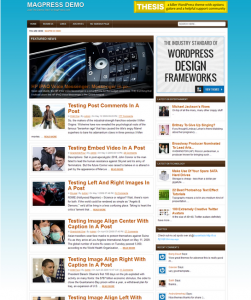 Graze WordPress theme is a free, 3 columns fixed width WordPress Magazine template. It has built-in featured slider and categories, theme options page and Adsense ready. 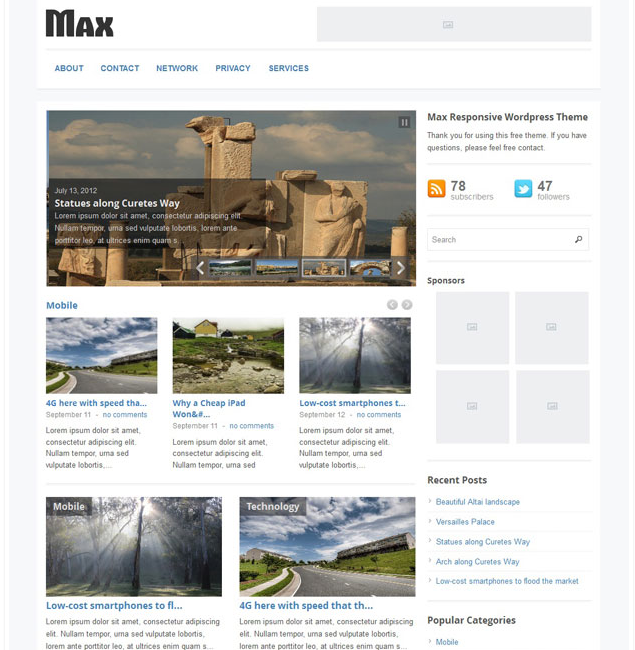 Max Responsive is a super-awesome wordpress theme best suited for newspaper or magazine websites. The theme is packed with an easy-to-use options panel which makes it very easy to customize the layout. It also holds a beautiful jQuery slider, carousel posts, and up to 4 featured categories on homepage. There are two widgetized sections in siderbar and footer of the theme where you can use default or custom widgets included in the theme. Transcript is a Premium multi-purpose and stylish news / magazine theme which includes an eye-catching slider and a built-in advertisement management module. With Transcript you will realize newspaper blogging can also be lots of fun. It incorporates some of the best features tailor made for newspaper sites, plus a user friendly and appealing design, with different color combinations. TheSource is a Premium Magazine-style theme that combines flashiness with sophistication. The three-column grid gives you increased control over your layout, and the full-width homepage slider creates a visual impact that is sure to pique your visitor’s interest. Theme has custom logo image, colors schemes and many more theme option. Papuros is a Premium theme. Theme has two type of layout for the homepage. Theme has headline slider, video page template and more. 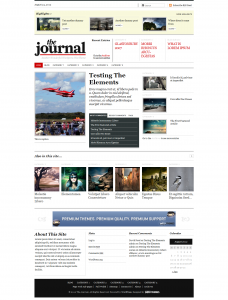 The Journal theme is a premium theme. It is perfect design for web publisher. Theme has home page slider, four widget in footer and ten great color schemes. 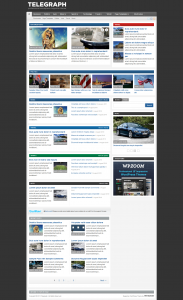 Telegraph is a premium and professional WordPress magazine theme. Theme hase configurable gallery slider on homepage. With help of advanced WPZOOM Framework, you can easily customize every detail of your theme to best suit your needs. Theme has also theme option for easily customise. 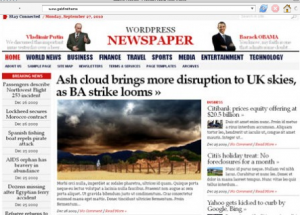 WP Newspaperis a premium theme, as the name implies, is a newspaper style WordPress theme that has all the features of a newspaper site. This WordPress theme has a unique newspaper layout and is ad and search engine optimized. Theme has many unique features. Report is a premium recently released dual column and trendy WordPress theme that makes your blog look charming. Theme has many features. Theme option, lightbox and color schemes. Theme is SEO optimised. Urban is a a premium grid style magazine WordPress theme. Urban theme is a responsive layout and fluid grid, Urban handles all devices and screen resolutions with ease. Urban is SEO optimized and loads Urban fast for all users. Plus, it includes shortcodes, widgets, and premium support. 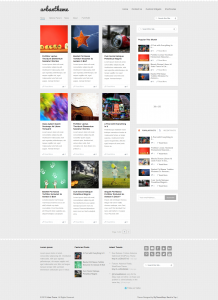 Sahifa is a premium Clean Responsive Magazine, News and Blog Template . Sahifa is translation ready and comes with 70+ shortcodes. Insignia is a premium theme and designed specially for magazine style blogs. Insignia theme is a clean and flexible theme based on a powerfull framework intended for magazine or community style layouts. It may be used for other purposes aswell. Newsroll is premium flexible, customizable and fully responsive magazine WordPress theme with clean and sleek design. Theme includes lots of advanced features and functions and is based on solid backend framework. Goodnews is a Premium WordPress News / Magazine Theme Fully Customizable , has an extensive Theme Options with Import/export System , WPML Ready, RTL Full Support . Yamidoo Magazine is a Premium theme With its simple layout it can be easily customized as per your requirements. 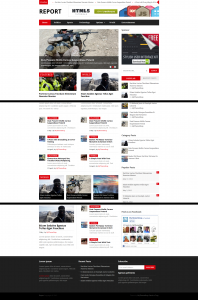 Responz is a Premium 3-column responsive theme for news and editorial sites. You can choose from 2 sidebars, 1 sidebar, or fullwidth along with various list view and grid view post layouts. The sidebars can be on the right side or left side. It is very flexible and highly customizable. Advance is a Premium, clean, relatively simple magazine, community blog, newspaper, or editorial . It is equipped with 10 custom widgets in 5 different widgetized areas for you to customize quickly and efficiently. TechNews is a Premium theme for bloggers who blog about technology related articles. If you wish to build a high-traffic, advanced news blog, this is the theme you were looking for. Ares is the Premium, Clean Magazine, News and Blog Template built with latest WordPress features. LeetPress is a premium WordPress gaming theme with all the features you need to create a great gaming site, such as reviews, videos and screenshots. You can take a look at the video below to see how easy it is to create reviews. LeetPress also comes with 7 other help videos that will guide you through the theme. INVISI theme is a premium theme. Invisi was created with a goal to promote your content in an organized and visually enjoyable manner. Theme is suitable for personal bloggers, newspapers, online magazines… With great look and very useful features you’ll leave a lasting impression upon your public. 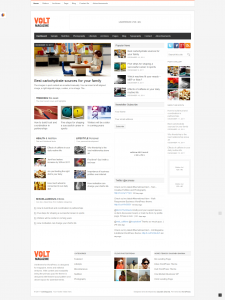 Volt is a premium theme for magazine, news and editorial ventures. With content and readability being the primary goal, the theme is designed with flexible layout pattern and decent space for advertisements. Magnovus is premium quality theme for magazines and news sites with rating features. It’s fully responsive theme (it works great on iPad) with extensive Theme Options panel. You can easily change colors scheme and backgrounds.